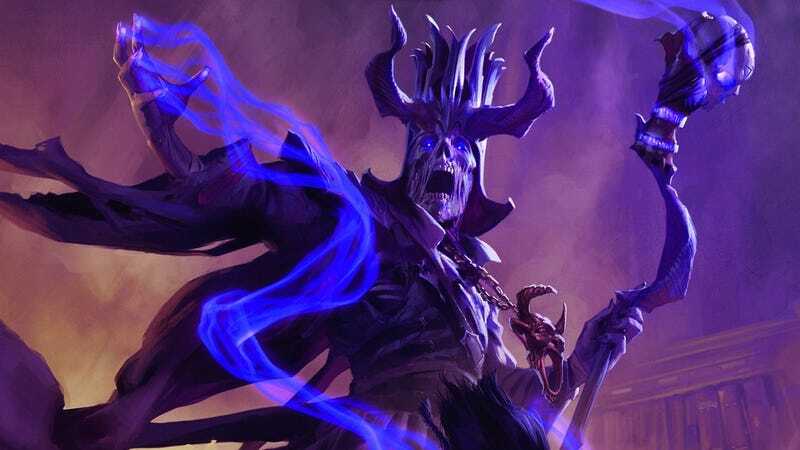 Here are some of the things you can do with the 5th edition Dungeon Master's Guide: build your own world; invent your own magic spells; tinker with the rules of the game; learn how to be a better DM; write your own D&D adventures; create a random dungeon by rolling dice. For that reason, this isn't a book that's going to be useful to everyone. If you're only casually into D&D, don't really plan on being a DM, or are content to run published adventures using the core rules, the DMG doesn't have a lot to offer you (and that's not a value judgment — you don't have to be up to your eyebrows in rules minutiae or world-building to enjoy D&D). But if you are into those things, you are going to spend a lot of quality time with these 300-plus pages. The book is divided into three sections: Master of Worlds, Master of Adventures, and Master of Rules. Each section appeals to different aspects of being a DM. Master of Worlds starts out painting broad strokes, offering a ton of advice on creating a fantasy world from scratch to set your D&D adventures in, and ways to develop and extend existing worlds. There's a fair amount of information derived from the Forgotten Realms, which is the default setting for D&D these days, particularly with regard to factions. All of this can be easily adapted to any world, of course. From creating the cities, realms, and dungeons your players will explore, you quickly move on to more abstract aspects of world-building. A lot of attention is given to a campaign's theme, proving that every D&D game doesn't boil down to standard fantasy tropes. You could focus on mystery, horror, or intrigue, or wrap your campaign around Wuxia or mythology. The cosmology of D&D is given a thorough going-over, including a map that will help you visualize all the weird planes and demiplanes that make up the D&D multiverse. While I found this chapter well-made and with a lot of practical advice for novice DMs (tailored to D&D as it is), world-building is obviously a massive subject, so it feels a bit limited. I recommend some of the fantastic articles on world-building by Charlie Jane Anders, as well as the Kobold Guide to Worldbuilding if you want to explore the topic in more depth. The second section, Master of Adventures, details the creation of specific locations and encounters, and combining them to form an adventure. There's a lot of good DM advice on building fun combat encounters, creating interesting and memorable NPCs on the fly, how to handle overland travel through wilderness, and how to design, map, and populate a dungeon. Of particular note is the section detailing the rules on building balanced encounters. By calculating the levels of the party members, you can figure out how many monsters at various challenge levels to put into an encounter to make it either easy, medium, hard, or deadly. The core 5E rules don't really make a big deal about balancing encounters — sometimes you have to talk or magic or flee your way out of a situation because it's too dangerous to go in swords swinging. But the Dungeon Master's Guide is a book that, above all else, acknowledges that everyone plays RPGs a little differently, so it gives you every tool you might conceivably need to play your way, including meticulously building encounters based on an XP budget. A massive chunk of this section, about 100 pages, is devoted entirely to magic items. We previewed some wondrous items a few weeks ago. Rest assured this section is packed with random treasure tables, magic swords and armor, potions, scrolls, staffs, wands, rings, tomes, various bits of Vecna, bracers, decks of many things, and even bracers. Bracers! There are some new items in there that I don't recognize from old editions, too. Finally, we have the Master of Rules section. This is where you really get to delve under the hood and start rearranging D&D's rules until they're just the way you like them. But this section isn't just for experts and longtime players. It starts out with a ton of truly great advice for running exciting, fun, memorable D&D games. Different types of players, the types of adventures they like, pacing, whether to hide or show your rolls, metagaming, when to use ability check — there's so much great info here. It's like 100 Dragon Magazine articles distilled into one chapter. One of the interesting things I learned about this new edition of D&D when I talked to lead designer Mike Mearls this summer was that there were some areas where he would have liked to push D&D in a slightly more radical direction and incorporate some of the innovations in RPG design that have come along in the last 20 years. But the publishers know a huge chunk of their audience is made up of RPG traditionalists who, in the aftermath of 4E, would have screamed bloody murder at anything too far off the path. There was a limit to how far they could push. But a lot of those ideas turn up in this part of the DMG. For instance, there are alternate ability scores: Honor and Sanity. There's a great alternate system for proficiency bonuses, where each increase lets you roll a bigger die instead of getting a static +2 boost. Some of these options are throwbacks to old systems, like weapon speed factors or the ability to use "healing surges" during combat. There are so many great optional rules presented here that you can customize your D&D game to be as modern, free-form, minimally statistical or as old-school, numbers-heavy as you want. Or any combination that falls in between. Frankly, it's hard for me to think of any optional rules or modular systems that they left out. There's more in the Master of Rules section, too. Specifically, a very detailed look at how to create your own monsters. It's quite exhaustive, and it's kind of amazing — this is basically open source D&D (in a philosophical sense, not the legal sense). You can quickly patch together a creature by swapping out pre-defined abilities from other creatures, or you can go through an exhaustive checklist and build something from the ground up. Once you're through all three sections, there are still some damn fine appendices. A personal favorite is a series of tables that let you generate a random dungeon by rolling dice. There are some great sample maps (a few dungeons, a town, a city, a ship), and an index of monsters sorted by challenge rating. The production values are impeccable throughout this book, and it's filled with wonderful new art. There's a subtle difference between the art direction here and in the Player's Handbook — that book naturally focused on images of characters, front and center. The DMG tends to have more landscapes and group shots, or just utilitarian pictures of traps or magic items. It's not an absolute thing, there are plenty of images of characters here, but there is an overall feeling of your D&D world expanding beyond your character. If this seems like a glowing review, well...yeah. I like the other two core 5E books, and my gaming group is collectively pretty excited about the edition too. But I love this book. There's just so much here, so many tools to use, levers to pull, switches to flip. At the same time it manages to accomplish something D&D desperately needs — it teaches you how to be a DM. If this new edition is going to draw in lots of new players, some of those new players will have to don the DM's mantle (literally, it's in the rules that the DM has to wear a cape*). Beginner or veteran, this is an epic tome that should guide you through many, many adventures. *You don't really have to wear a cape, but why wouldn't you?